Enjoy the French Creek Valley while staying at the Homestead Country Retreat. Quaint and comfy, enjoy three-plus bedrooms and a complete kitchen to prepare your favorite dishes. And don't forget the playhouse that will provide hours of fun for the children. The family purchased the land in 1855 and continues to be the stewards of the land. Come and enjoy our eight-generation farm. 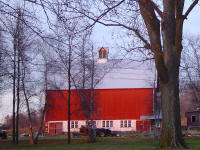 Experience our family dairy farm less than two miles from the retreat! We rotationally graze our dairy cows. See how naturally these cows harvest the majority of their feed during the growing season. 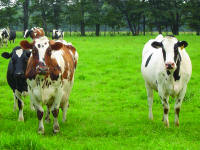 Walk the pastures, see the birth of a calf, watch milking, enjoy the growing crops and relax in nature. Enjoy whitetail deer or turkeys fanning out in our peaceful country setting. Maybe hear a coyote howl as you sit and visit in the evening. The songbirds will wake you to a beautiful day in the country. Enjoy hiking, biking, cross country skiing or snowmobiling. Catch a fish, go canoeing, play tennis, or just read a book! From quilting to antiquing, you decide what to do as you relax and unwind at the Homestead County Retreat. Stay at the Homestead Country Retreat for $150 USD per night; includes full use of the retreat, including sleeping space for six or more, a furnished kitchen (you supply the food), and an abundance of peace and quiet.